In preparation for the centennial of the Chapel, Bishop John J. Dougherty, President of Seton Hall University, engaged the church design firm of Rambusch to oversee its renovation. Funds for this project were provided by Mr. and Mrs. William Henderson. 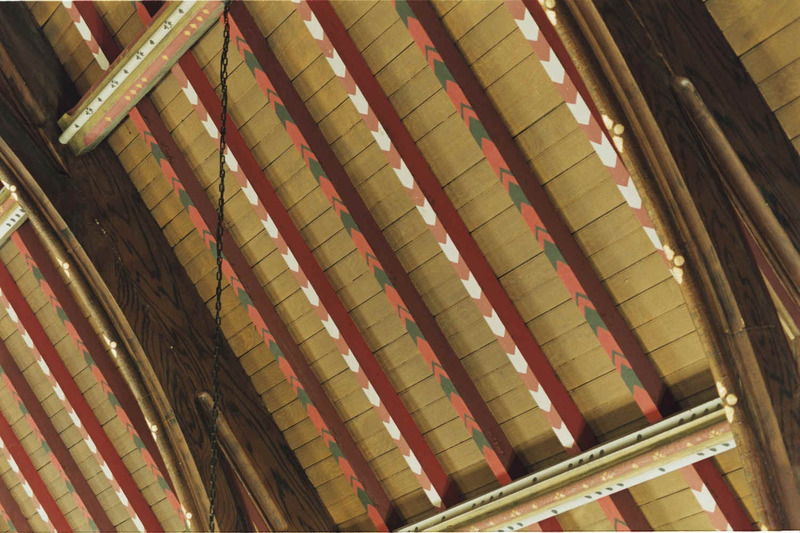 The ceiling was painted and accented with chevrons of several colors. 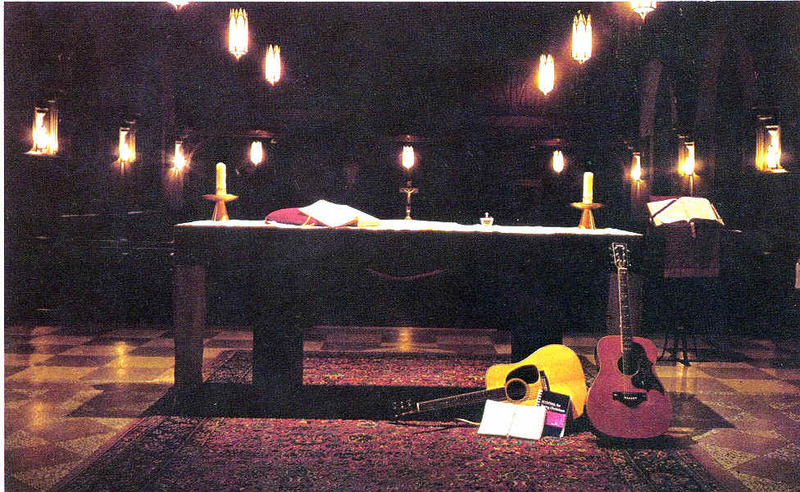 A Rogers Three Manual Electronic organ was installed, and carved wooden gothic reredos, decorated with gold leaf, placed behind the side altar statues of the Blessed Virgin and St. Joseph. 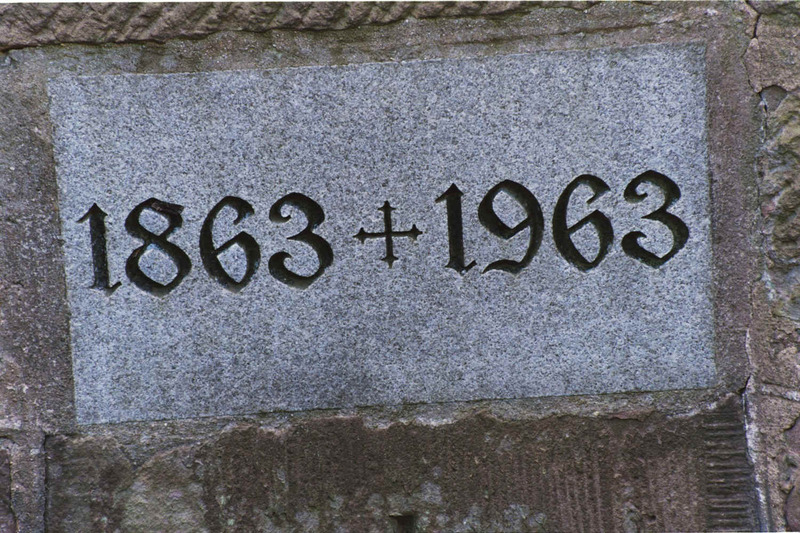 A new cornerstone was placed noting the date of construction and date of renovation of the Chapel. 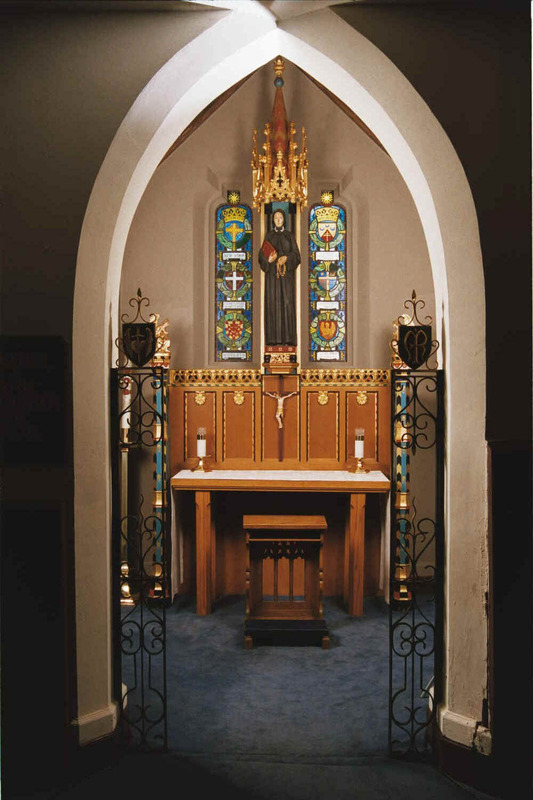 Most significantly, the Chapel of the Sacred Heart, which had been placed in the old side entrance as part of the early twentieth century renovation, was replaced by a shrine to Mother Seton. Mr. William Henderson, the donor of the funds for the renovation, objected to the ceiling design proposed by Msgr. William Noe Field. Msgr. Field drove Mr. Henderson to West Point to show him the Academy Chapel ceiling decorated in the manner he had suggested. Mr. Henderson then agreed to the design. Unfortunately, there are few contemporary photographs of the Chapel that show this renovation clearly. 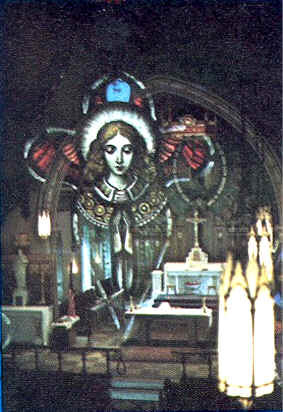 This photograph, with a superimposed stained glass angel, gives us a view of the sanctuary after the 1963 renovations. The gothic reredos behind the statue of St. Joseph are clear. 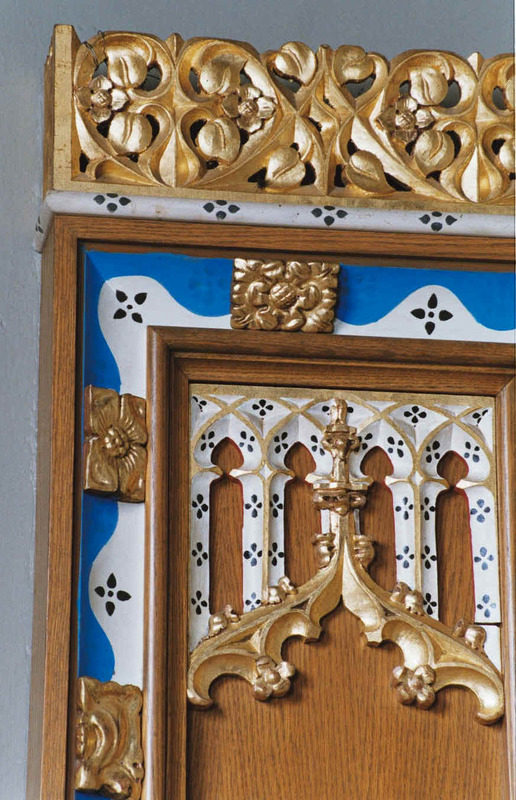 They consisted of oak panels decorated with gilded gothic tracery enhanced with blue and white, the Seton Hall colors. On the white are black ermine or miniver tails, the heraldic symbol for ermine. The statue, above the tabernacle, is crowned with a canopy of similar design. A temporary wooden altar facing the people was installed after the completion of this renovation. The gates of the altar rail were removed and replaced with a rope for closure. The most significant aspect of this renovation was the installation of the Mother Seton Chapel. Although there is a stained glass depiction of Mother Seton in Presidents Hall, this chapel is a long-overdue tribute to the woman in whose honor Seton Hall was named. Elizabeth Ann Bayley was born in New York City on August 28, 1774 and baptized in the Episcopal Church. In 1794, she married William Bayley, with whom she had five children. William died in 1803. 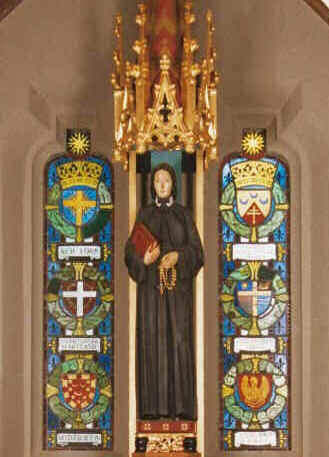 Elizabeth Bayley Seton converted to Catholicism in 1805. Soon after she dedicated her life to the education of children and founded a religious community for this apostolate in 1809. She died in Emmitsburg, Maryland, on January 4, 1821. Elizabeth Seton is regarded as the foundress of the Catholic School system in the United States. She was beatified by Pope John XXIII and canonized in 1975 by Pope Paul VI. She is the first American-born saint. Her nephew, Bishop James Roosevelt Bayley, was the founder of Seton Hall College. The wood statue of Mother Seton is placed under an ornate gilded oak gothic canopy above an oak reredos of similar design. In front there is a small altar. The reredos are supported by blue, black and gold posts topped with gilded angels facing inward. The entry is flanked by wrought iron frames topped with heraldic symbols of the titles of the Blessed Mother. The renovation also included the installation of stained glass windows in the Mother Seton Chapel and in the Sacristy. A modest memorial plaque on the left side of the Chapel is a reminder of the sacrifices made by alumni during the 1960s in the Vietnam War. Four alumni and the dates of their deaths are recorded. 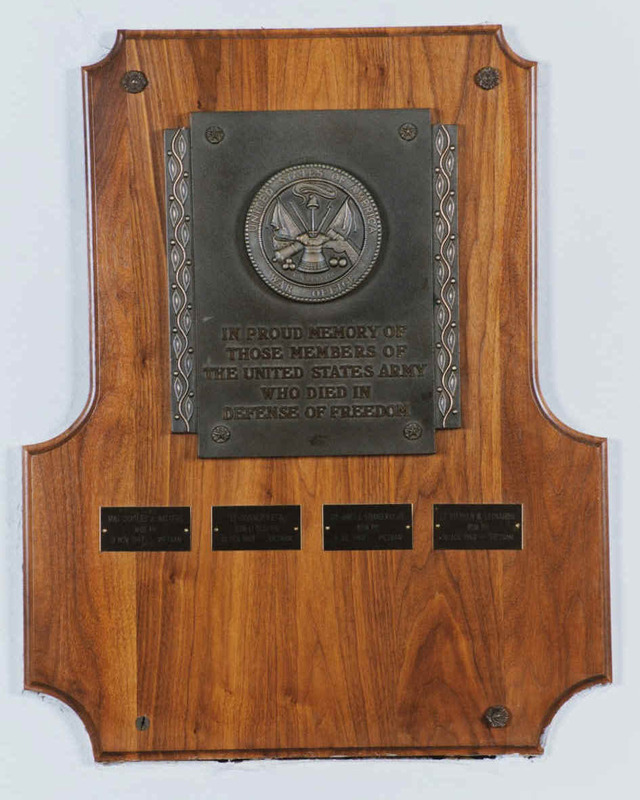 One of these, Major Charles J. Watters, a Catholic chaplain, was posthumously awarded the Medal of Honor, the only Seton Hall alumnus so honored. To commemorate the 1963 renovation and honor the donors, this stone memorial was placed in the Chapel entryway. It is confusingly vague. Rt. Rev. Joseph H. Meehan donated the chancel stained glass and was the major donor to the 1931 renovation that included the Raggi murals. 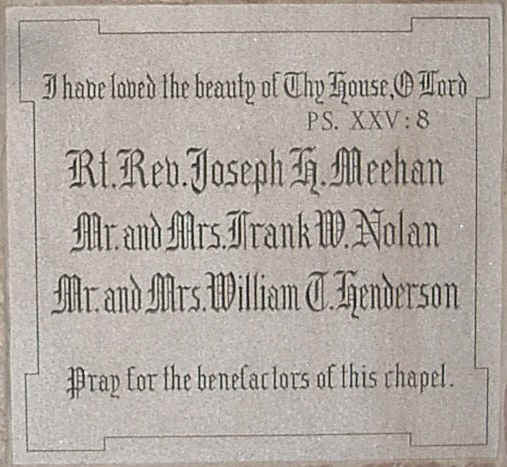 Mr. and Mrs. Frank W. Nolan were the benefactors who made the 1947 renovation possible. Mr. and Mrs. William T. Henderson donated the funds for the 1963 renovation. Although marriages had taken place in the original college chapel in the Elphinstone Building and in the present Chapel in the early days of the college, they had become rare occasions, requiring special permission. However, due to many requests from alumni, in 1969, Archbishop Boland agreed to Bishop Dougherty's request to permit marriages in the Chapel. Ever since, the Chapel has been a favorite place for alumni to celebrate their marriages - and to baptize their children.